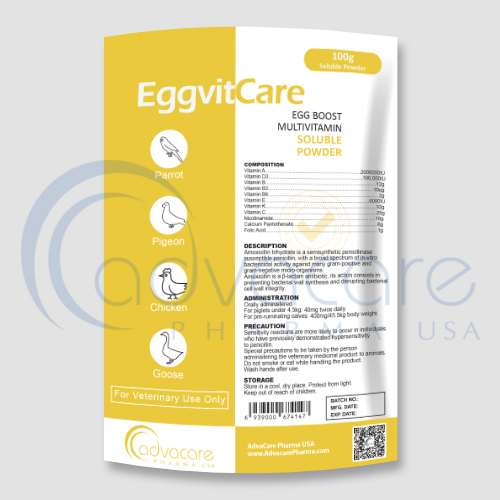 *AdvaCare Egg Boost Multivitamin Soluble Powders are GMP certified. **AdvaCare Egg Boost Multivitamin Soluble Powders are manufactured in our facilities located in China, India and USA. 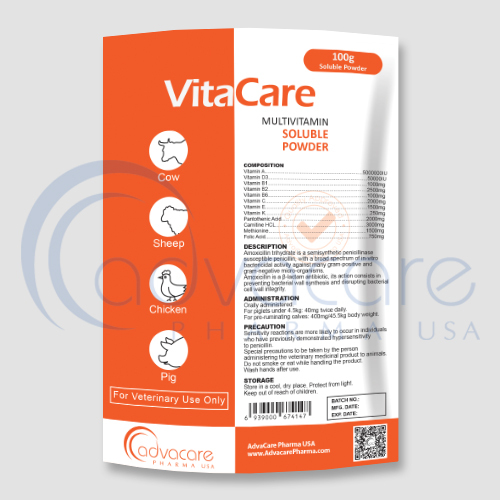 AdvaCare is a GMP manufacturer of Egg Boost multivitamin soluble powders. Egg boost multivitamin soluble powder is a highly concentrated water-soluble nutritional supplement formulation of essential vitamins, minerals, fatty acids, fats, protein, fiber and probiotics. When added to feeding stuffs, our balanced formula provides optimal nutrient supplementation for strong and healthy chickens (poultry). It is formulated to support the optimum level of bird health, while boosting the nutritional quality of eggs with enhanced levels of Omega-3 fatty acids and vitamin D-3. Also included are fats, proteins, fiber and probiotics which promote good gut health and immunity. Common side effects include: hypersensitivity towards the drug. Always consult a veterinary physician or animal care specialist before using egg boost multivitamin soluble powders. If the condition does not improve or becomes worse, then call a veterinary physician or animal care specialist. It is indicated for boosting egg production in pullets, stressed layers (e.g. following vaccination), apparently healthy laying chickens, old layers towards the end of their laying cycle and breeding flocks. It is used in the treatment and prevention of bacterial infections caused by gram-positive and gram-negative microorganisms and vitamin deficiencies due to infections and other stressful situation. It is a nutritional supplement and mainly used to improve animal immunity which also promotes livestock melanin along with ruddy and shining skin. General recommended dosage: 1g of egg boost vitamin soluble powder per liter water. It is recommended to be taken orally through drinking water. Medicated water should be used immediately and refreshed every 24 hours for the duration of the treatment. 10 days for neat and milk from last treatment. It is recommended that the susceptibility of the causative microorganisms is established before the imitation of the treatment. Egg boost multivitamin soluble powder is not meant for human consumption. Consult a physician immediately in case of accidental consumption. Consult with an animal care specialist about any other medications that are being taken by the animal, and their medical history, before their treatment with egg boost multivitamin soluble powders.